Displayed in Dubai and up for sale, the Chateau Margaux 2009 Balthazar is priced to be the world’s most expensive red wine. Widely reputed to be one of the best vintages ever produced by Château Margaux. This is the first time in the history of Château Margaux that Balthazars have been bottled. Only six Balthazars have been produced, of which only three will be offered for sale; all available exclusively through Le Clos. 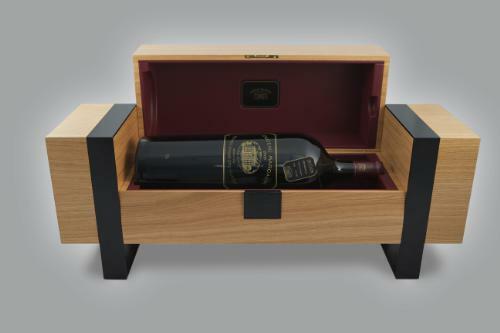 Engraved with gold, the 12 litre Balthazar is housed in an impressive case of oak and raised on steel legs symbolising the barrels resting in the Château Margaux cellars. The purchaser will be flown first class to France to visit the first growth’s estate, enjoying a private tour of its cellars and vineyard, before having dinner at the Château hosted by Paul Pontallier, Chief Winemaker and Managing Director of Château Margaux. The wine is being sole in Le Clos exclusively through its Dubai flagship store.